8.40 points at 45 votes (rank 37). This program is actually not a game. 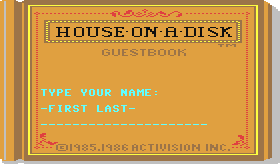 According to the description of the publisher Activision the program delivers the code which is necessary to represent a fully furnished house on a computer. This "House on a Disk" is based on the theory that every computer has an "occupant" (i.e. 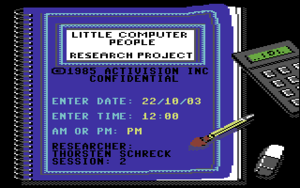 Little Computer People - LCP), which can be made visible by providing accommodation. Every computer should have a different LCP, who is usually accompanied by a dog as a pet. It is in fact of course merely a simulation of the above. At the start of the life of each LCP his name and appearance will be randomly picked and saved to "UR-floppy" (Note from H.T.W. : In the first series each disk contained a different character, see Miscellaneous / Game History). Each time you restart the game, a session count is incremented. The game doesn't have to be running permanently to simulate time. However, you are responsible for the survival of the LCP. You need to provide food and drinks, give him gifts like new records (CDs didn't exist back then :)) and books, or caress him from time to time. Moreover, your LCP likes to use the phone very much. If you ask him to write you a letter, he'll type on his typewriter about his feelings and what he misses. His facial expression also tells you about his mood. When his mouth hangs, he is sad and you should play with him. It's easy to do that by typing "play with me", after which you can play cards. You can choose from Poker and Hearts. To keep him happy, you should also let him win sometimes. In order to improve his mood you can also try to give him presents or stroke his head until he looks happy again. Sometimes he likes it when you bring lots of food and drinks into the house. Caution is advised when the LCP's face is green. He doesn't have enough food then. You can also communicate with your LCP, by just asking him what you want him to do. "Please play with me", or "Please play piano," or "Please write a letter to me", or "Please talk to me," make him do things. He also can dance if you ask him. The house is shown on a single screen in 2D. Many details are clearly visible. The LCP and his dog are cute animated sprites. In addition to the very realistic sound effects, a variety of musical pieces are integrated - HVSC contains 17 different pieces. Some of the pieces already were published in the game Master of the Lamps, but there were added some seasonal songs too. At Christmas you'll hear "Jingle Bells" for example. In the program, the music is used when the LCP is playing the piano or when he puts on a record - on which he sometimes dances or he does some aerobics. The keyboard commands don't work at the beginning of a new game in the first 5 - 10 minutes. In this phase the "new" LCP walks through and examines his house. The following commands are entered at C64 in combination with the CTRL key. In the VICE emulator the CTRL key is the TAB key. CTRL F (Food) Food will be delivered at the door. CTRL W (Water) The watertank will be filled up a little. CTRL A (Alarm) Rings the alarm clock. CTRL D (Dogfood) Dog food will be delivered at the door. LCP does the rest. CTRL C (Call) The telephone rings. LCP loves to make telephone calls. CTRL P (Patting) All Little Computer People love this. CTRL R (Record) Give LCP a record. CTRL B (Book) Give LCP a book. * Please type a letter to me. * Please build a fire. * Please play another song. To change the name of the observing scientist (you), you can enter "logon please" after which the LCP runs the "Name Changer" program on his computer. After entering "1" on the keyboard, the program starts. Just follow the on-screen instructions from then. 1. LCP Evictor: Deletes the research data and creates an empty house. 2. LCP Creator: Creates a new LCP on the LCP disk. 3. LCP Hotel: Save the current data to another disk. Some of the terms that LCP understands. Whether the LCP follows instructions depends on recent research, the mood of the LCP as well as his character. TheKills: "Actually my undisputed favourite. It's impressive to see what they were able to program. It's the predecessor of Sims and co. 10 out of 10 for that!" Triton: "Way ahead of it's time: developer David Crane proved his genius in 1985 with this daring game. One of the few social-interactive games, which even today are hard to find. You just have to enclose the sympathetic little man and his funny feeble-minded dog into your heart. 10 out of 10." if/TRSi: "One of the most lovingly built games which I ran for days on a computer in the living room - and when I had visitors, they always came into contact with this very first Tamagotchi... I still have the original game with the research map"
Quapil: "Sigh... the good old days. LCP was my first original game, my parents gave it to me for Christmas, together with my C64. At first I was a little bit skeptical due to the lack of action, but soon I liked having the little guy and his dog really much. All those times we've played cards :) One of the most original games ever and a great way to spend your time. 10 out of 10 points for my Roscoe." 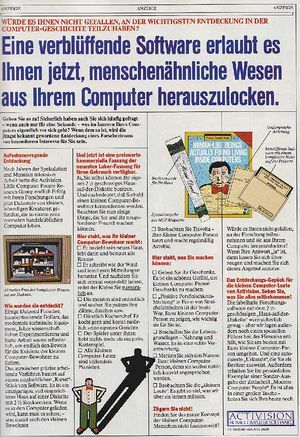 "The idea for Little Computer People was bought from a developer outside the company. I was interested in the potential of the product, and recommended the purchase. The original name was "pet person" which was based on the name "Pet Rock" (a craze from the 60s; to purchase a stone as a pet including training manual). The first plan was to design the program as a kind of aquarium, without user input. After I rewrote almost half of the program code and integrated additional interactivity, the product was finished. An interesting thing about the program, and what most of the buyers didn't notice, is that it has been duplicated within the company. Since we had control over each disc, we gave every copy of the game its own unique serial number. 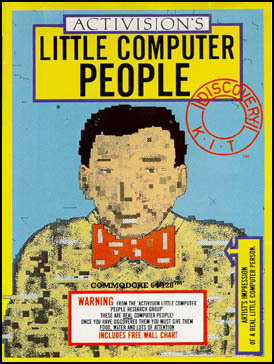 This number was then used to generate the personality, appearance and behavior of the Little Computer person on this disc. Based on the serial number, the following was determined: name, shirt color, personality characteristics, etc. These were determined independently, probably a lot of serial numbers generated a computer person named "Tom", but the chance that two of these also had the same color of shirt was almost zero. Each disc was effectively unique." The program is not "2000" compatible. The session dates are always associated with the 20th Century, which means that the LCP lives in 1906 for example. The Little Computer People are a victim of the "Y2K bug". Based on the theory that it is merely a programmed house, it can be assumed that a computer error does not affect the LCP. The Copyright from Activision is dated 1985/1986. The file "AB" was reprogrammed. This file from the original version with blue/black login screen also contains copy protection on FatTrack 35/36.